Swn y Mor is a converted ground floor one bedroomed apartment situated over the road from the beautiful blue flag beach in the traditional seaside town of Barmouth. It consists of one double bedroom, a lounge dining room with Wifi, digital tv, CD player, sofa bed, and dining table. 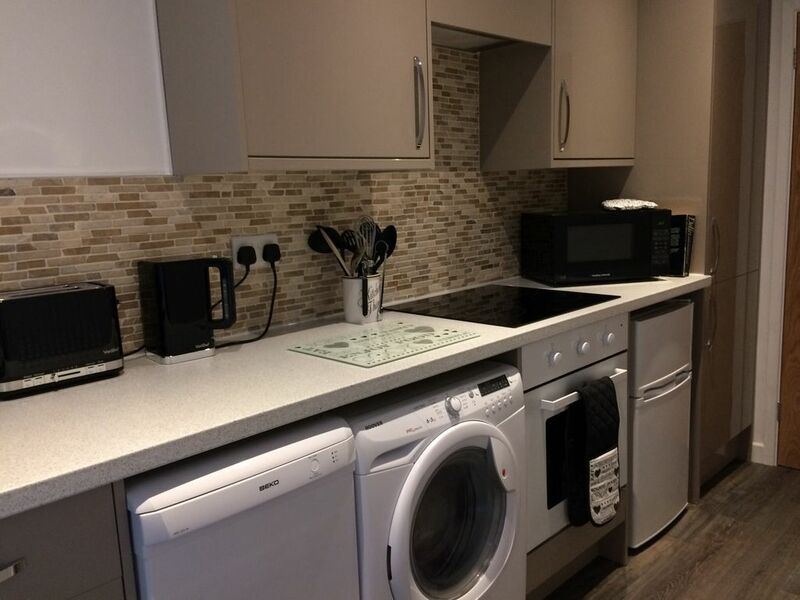 There is a newly fitted kitchen which consists of sink, dishwasher, washer/dryer, oven and grill, hob, extractor fan, under counter fridge freezer cupboards with ample cooking and eating facilities. Leading onto the newly fitted bathroom with fitted vanity unit wash hand basin and toilet, bath with mixer tap and a seperate electric shower over. There is a glass shower screen and electric heated towel rail. There are views of the sea from both the bedroom and lounge and outside there is a small seating area where you can sit listening to the sound of the sea whilst watching the sun go down and enjoying the beautiful sunsets. The property also has off road parking which you are welcome to use, a bonus as parking is often a premium in Barmouth. Linen and towels are provided, the bed will be freshly made up ready for your arrival, but we do ask that you provide your own beach towels as we request that the apartment towels remain in the property and not taken to the beach. Barmouth town centre is only half a mile or 10-15 minute walk away depending on how fast you walk or you can take the land train as it passes by during peak season. There are shops, cafes, bars and restaurants, donkeys, ice creams and traditional seaside fish and chips and a sweet and rock shop. There is a train station and buses giving access to the Welsh Coast, Snowdonia National Park and all its attractions. The Welsh Coastal Path runs the full length of the Welsh Coast with all its beautiful beaches and seaside towns. There's walking, cycling, pony trekking, golf,boat trips, paddle boarding, crab fishing and sea fishing. For the children there are indoor and outdoor play areas. For the teenagers a skateboard park, football and basketball courts and tennis court. Within the surrounding areas there are many traditional tourist attractions such as the mountain railway to Snowdon or climbing for the more adventurous or castles and caverns to be explored. There is also pony trekking and many new adventure attractions such as zip lining, in cavern trampolining, tobogganing and paint balling. There is not enough time to do it all in one visit so please come back and visit us again! Paul and Anna Matthews look forward to meeting you. Being seconds from the beach and only half a mile from the town, you get the benefits of both the quiet location and the bustle of the town. Having a drive to park on is a real bonus in Barmouth as parking is at a premium here. Your bed will be ready made up for your arrival. Please bring your own beach towels kindly do not remove the towels from the property. Lockable bicycle storage is available. They can be stored at your own risk as we do not take responsibly for and loss or damage. Anna and paul were very friendly and helpful and greeted us as we approached the property. They left us a welcome hamper which was a lovely touch, as they had left my daughter and her friend a box of maltesers each and some handmade soap as well as some tea, coffee, etc. and dishwasher tablets and washing powder. The apartment was newly decorated and spotless and they provided all the towels and bedding. The apartment itself was literally a stone's throw from the beach and a pleasent five minute walk to the shops and restaurants. It was a very pleasant and relxing weekend and we will definitely try and book again. Well appointed apartment right by the beach. A short walk on the flat into town. Everything we could have wished for. Thank you. Excellent apartment for a couple wanting to stay in lovely Barmouth. Every facility you could possibly want. Anna and Paul perfect owners. Would definitely return and highly recommend it. Overall. Impressed, hence why we went back. Very impressed as this is our second visit too Barmouth and stopped in Anna and Paul's apartment. I recommend staying there. This was the first time using Homeaway and we had a wonderful escape this Christmas. The apartment was excellent and we received a lovely warm welcome from Anna and Paul . The apartment had everything we needed and was extremely well appointed. A lot of time had been spent selecting the right fixtures and fittings and we immediately felt at home and comfortable. We loved the small hamper on arrival which was a very thoughtful touch. The positioning is ideal for the beach in the summer and an easy walk to the shops, restaurants and bars for entertainment in the evening if so desired. We left the car safely parked off the street next to the property for all three days of our stay as there were plenty of local walks to enjoy and generally just pleased ourselves. Walks up into the hills for the views and along the beach and railway bridge were excellent . If you have bikes then Barmouth to Dolgellau on the old railway route is a must with a stop at the pub on route half way. A comprehensive information pack is available in the apartment for local eateries, attractions and entertainment suggestions. It also contains valuable appliance information just in case you get stuck. We have no hesitation in recommending this apartment. Many thanks to Anna and Paul for an enjoyable stay. Happy New Year to all. Dave & Kim , Shropshire.